September 23, 2013, 1:03 p.m. When media reports cover gun crime and mass shootings the public is frequently led to question whether the virtual violence in some games motivated real-world tragedies. Just last Friday Deputy Prime Minister Nick Clegg told listeners of his LBC radio show that games like Grand Theft Auto V, released last week, have a &apos;corrosive effect&apos; on players&apos; behaviour. 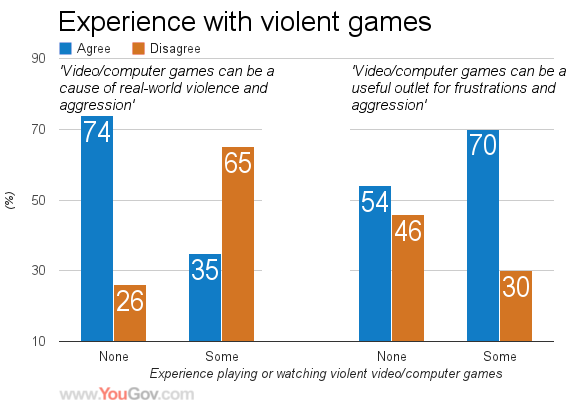 There are fierce debates and little consensus among scientists studying games and violence. Academic and industry researchers do agree that electronic games now constitute a mainstream leisure activity: The average game player nowadays is 30 years old – less than one third of gamers are under the age of 18. 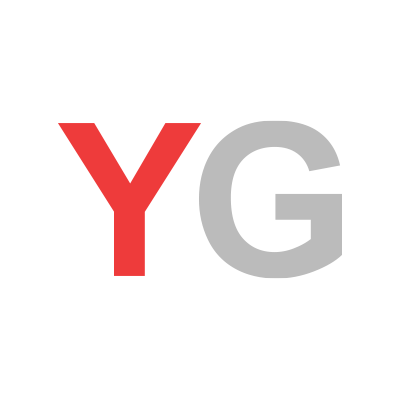 New research conducted by YouGov in cooperation with Dr. Andrew Przybylski, a research fellow at the Oxford Internet Institute, sheds new light on what Britons think about games. 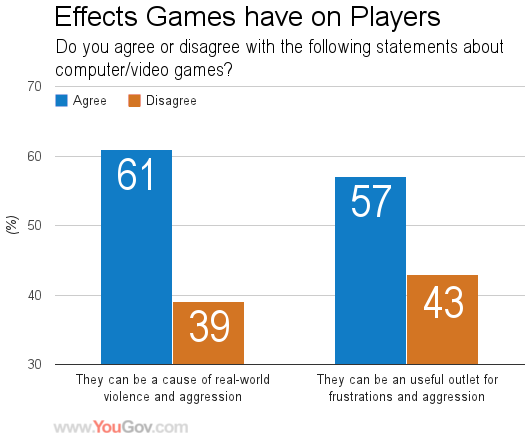 Overall, 61% of Britons with an opinion on the matter* believe games cause aggression, while about 56% think they provide a cathartic outlet for frustrations. More in-depth analyses of the data revealed these beliefs vary widely across the age, gender, and personal experiences of Britons. 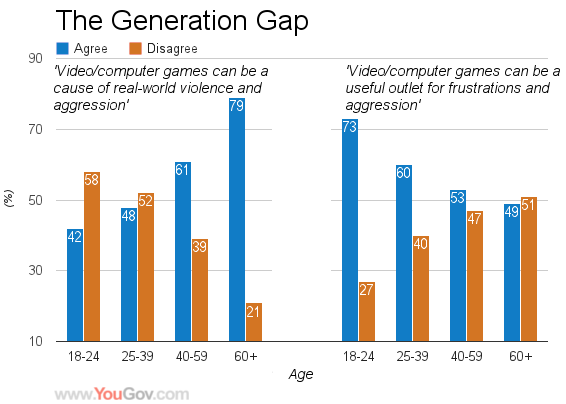 Analyses indicated that older Britons were more than five times (5.5x) more likely than younger people to believe that games may cause violence. In contrast, younger Britons were two and one half times (2.6x) more likely to think games provide a good outlet for everyday frustrations. 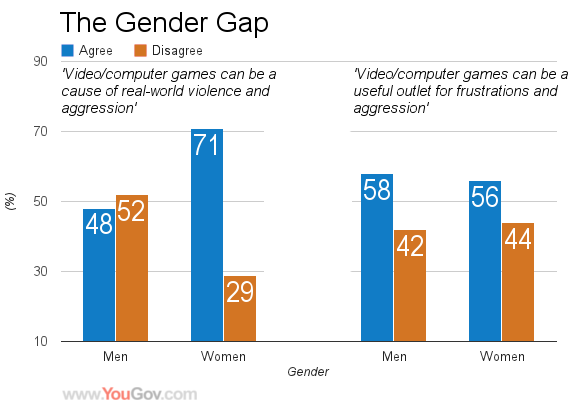 The poll also indicated that there were pronounced gender differences in terms of how people saw the effects of games. Female Britons were about two and one half times (2.7x) more likely to think games may cause violence yet both genders were equally likely to believe games serve a cathartic function. Perhaps the most telling contrasts between Britons’ views of electronic games are clear once their first-hand experience with games was introduced into the equation. Nearly two-thirds of Britons reported having watched a violent game being played or played violent games themselves. Further, almost half said they had recent first-hand experience playing games. Britons who have no experience watching violent games being played or playing these kinds of games themselves were over five times (5.3x) more likely to believe games could cause aggression in contrast to those who had, who were almost twice (1.9x) as likely to think games provide a cathartic outlet for everyday frustrations. The pattern observed in Britons exposed in some way to violent games extended to those who reported recent experience playing a wider variety of games. Individuals lacking any first-hand experience playing games were three times (3.3x) more likely to think games cause violence and those with who had recently played. 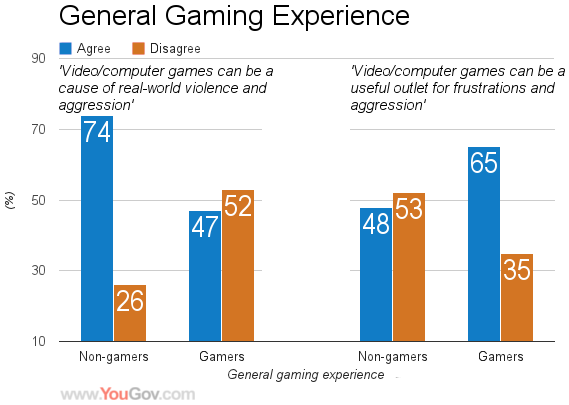 Those who had recently played games were twice (2.0x) as likely to think games served to lessen aggressive feelings. The present polling shows that Britons currently have mixed views of electronic games. This ambivalence might be temporary as the population at large becomes more familiar with games. It is possible that concerns about games could fade away in much the same way that fears about rock music, comic books, and radio dramas dissolved when these forms of entertainment gained wider acceptance. Andrew Przybylski is a research fellow at the Oxford Internet Institute (OII). Since 2005 his research has focused on applying motivational theory to understand the universal aspects of video games and social media that draw people in, the role of game structure and content on human aggression, and the factors that lead to successful versus unsuccessful self-regulation of gaming contexts and social media use. Click here to view more of Andrew’s work.